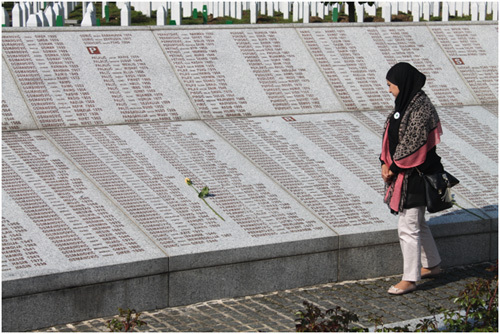 The third module of the EPIL Study Course III took place in Sarajevo, Srebrenica and Zenica from May 4 – 11, 2012. In this module, placed in the middle of the two-year course, the students encountered the post-war reality of Bosnia and Herzegovina and the country’s efforts to move into the future as it continues to deal with the traumatic experiences of the war years. Prepared by EPIL’s Bosnian members of the Academic Team, Sabiha Husic-Haskic and Jadranka Milicevic, and hosted by EPIL’s partners in BiH — the non-governmental women’s organisation Medica Zenica and the Islamic Faculty of Sarajevo — the module was a high point in the curriculum: It examined the role of religion in conflicts, and considered how religion might be employed to enhance the process of mutual understanding. To have a country which is divided into two entities along the same lines that had created conflict does not help integration; nor does it further the development of a state that functions according to European/EU legal standards. EPIL also explored some of the gender-based issues in Bosnian society. Djermana Seta, Head of the research department of the women’s organization, NAHLA, noted that “religion exploded in the public space after fifty years of enforced non-religion.” This explosion led to a certain “re-traditionalisation” of Bosnian Islam, and the head scarf emerged as a kind of marker of Muslim identity in the context of the secular state. Still, employers seem to prefer women not wearing the scarf in all positions dealing directly with clients, and to keep scarfed women (with the same qualifications) in the back offices. Emina Ceman, an Islamic Theologian and EPIL graduate addressed the issue of Social Capital and Social and Social Reconstruction of Bosnia and Herzegovina today. The group also met with the “Kolo of Serb Sisters St. Tekla” at the Orthodox Cathedral Church. A public event in Zenica, brough together twelve women peace builders from Government institutions, the Islamic community, Orthodox and Catholic Churches and Non-Governmental organizations in the country. Dr. Zilka Spahic-Siljac of the Centre for Interdisciplinary Studies, said that although women have been active for years in practical work and in research for peace, as educators, medical doctors, journalists and social workers, their visibility has remained low. Part of the discussion evolved around the question of how to make this work more visible and to give it higher esteem. Speakers emphasized that peace building is a work that involves the person in a process of transformation of values and attitudes, a slow process that begins with the person and then moves out through action to involve society as a whole. The 42 women of the EPIL group admired the strength and resilience of the women they met in BiH and the testimonies of tremendous courage they heard. EPIL participants were received by Bosnia’s Grand-Mufti, Dr. Mustafa Ceric, and his wife, EPIL Vice-President Azra Ceric. In his speech, Dr. Ceric focused on Bosnian Islam as “European Islam”, indigenous to the county and its citizens. These special experiences need to be brought into Christian-Muslim dialogue in Europe. Thanks to the untiring work of Medica director Sabiha Husic-Haskic and her staff, the module also had excellent media coverage in the print media and several live programmes on TV and radio. A list of the coverage can be provided on request. EPIL’s Module IV will take place in the Netherlands, September 30 – October 7, 2012, on the theme “The Challenge of Migrant Communities”.